Today we welcome Stephen Axelsen to the blog. 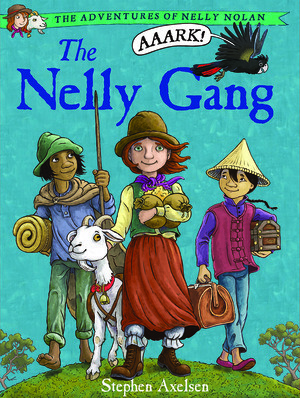 Stephen is here as part of a blog tour to celebrate the launch of his new graphic novel The Nelly Gang — you can read a review of the book here. We asked him some questions about how he goes about creating a graphic novel. 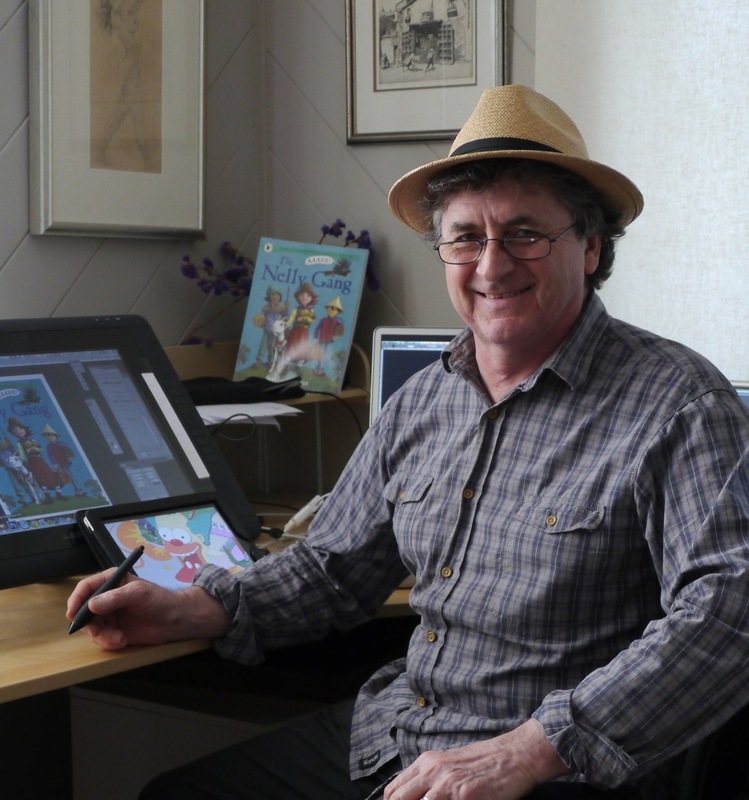 How is creating a graphic novel different from writing and illustrating a picture book? The biggest difference is that a graphic novel has a lot more pictures in it than a regular picture book, so they take much, MUCH, longer to illustrate. The writing takes a bit longer too. The Nelly Gang took more than a year to make. Also in graphic novels the story is mostly told in speech balloons. These balloons have to be designed and positioned so that they are nice and clear and don’t interfere with the pictures. Why did you choose to tell this story as a graphic novel rather than a picture book or otherwise? The story would not fit into a picture book, unless it was a very, very thick one. (There are up to 25 pictures on some double pages.) The Nelly Gang could have been a novel, I suppose, but I love drawing the old costumes and wagons and things too much just to use words. How did you go about creating The Nelly Gang? The story plan was the first thing put down on paper, but the very, very first ideas were pictures in my head; vague images of things I wanted to draw. Then I wrote the first story plan or plot, after which I began the rough drawings. The drawings would suggest new story ideas, and while rewriting the story NEW picture ideas would pop up, so I’d change the story again. The writing and drawing kept changing each other in an endless loop until I nearly went mad (or maybe I did go mad) and it was time to STOP and call the story finished. What sort of tools do you use? I used a mixture of ‘traditional’ and ‘digital’ media, which means that I did the drawing outlines with old fashioned pen and ink on paper, then scanned these into my computer where I tidied things up, added the colour then the speech balloons and text. The Nelly Gang is set in 1860. How did you go about researching for the book? A lot of my research was done online, but I also travelled to old goldfields, visited Sovereign Hill at Ballarat (which was excellent for picture reference) and even had a paddle steamer ride at Echuca. I had to have a paddle steamer in the story because they are such wonderful things to draw! Now that The Nelly Gang is out, are you working on something new? AND the sequel to The Nelly Gang, called Nelly and the Dark Circus. As the title suggests it is set mostly in a circus, and Nelly is in it. So is her goat, Queen Victoria, of course. Do you have any tips for young graphic novelists? The best thing to do is look at as many graphic novels as you can find, choose the ones you like best and copy bits of them. Very soon you will start having your own ideas and awaaaay you’ll go! Next Post An Aussie Year Writing Competition!